In our Gustav Klimt Special Edition journals, we celebrate one of the world’s most famous painters and his iconic paintings. Gustav Klimt (1862–1918) was an Austrian symbolist painter fascinated by Japanese art and the female form. He was a member of the Vienna Secession movement and, on trips to Venice and Ravenna, he discovered the mosaics that would inspire his famed use of gold. 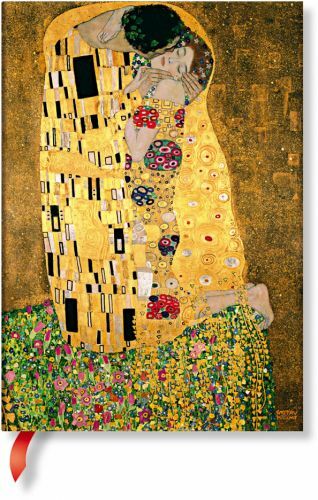 The Kiss (1907–1908) represents the pinnacle of Klimt's "golden phase." Oil and gold leaf combine to create sinuous shapes and colours reminiscent of both Arts and Crafts and Art Nouveau styles. The lustrous palette and intricate patterns make the painting one of the great masterpieces of the early modern period.